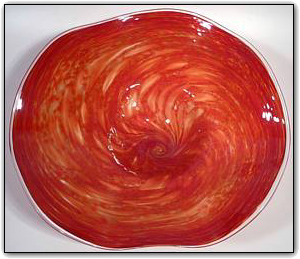 This large fluted bowl features fiery reds mixed with luscious gold topaz for a mesmerizing combination of colors. Sitting atop a perfect pedestal, the flutes are magnificently formed and measuring over a foot and a half wide this is one big bowl. Make sure to zoom in and take a look at just how intricate the colors are and they way that they perfectly interact with and compliment each other... so amazing!